This company rocks, their products are insanely delicious and perfect for on the go gluten free snacking. My favorite of the three reviewed products… Dark Chocolate Coconut Bites…. I have bought these in the past at a local store and loved them so was super excited when I got more for review. Since starting my new gluten free life I have tried many gluten free products I’ve purchased myself and many are horrible. I take a bit or two and throw them out. The taste or textures is horrible. I am not a picky person when it comes to food but if it’s gross I just can’t. Back before I was 100% GF I tried some products from this company and was very surprised by the taste, texture and quality, so when I got a chance to review for them I was super stoked. Everything they sent was delicious, full of flavor and the texture was just perfect. 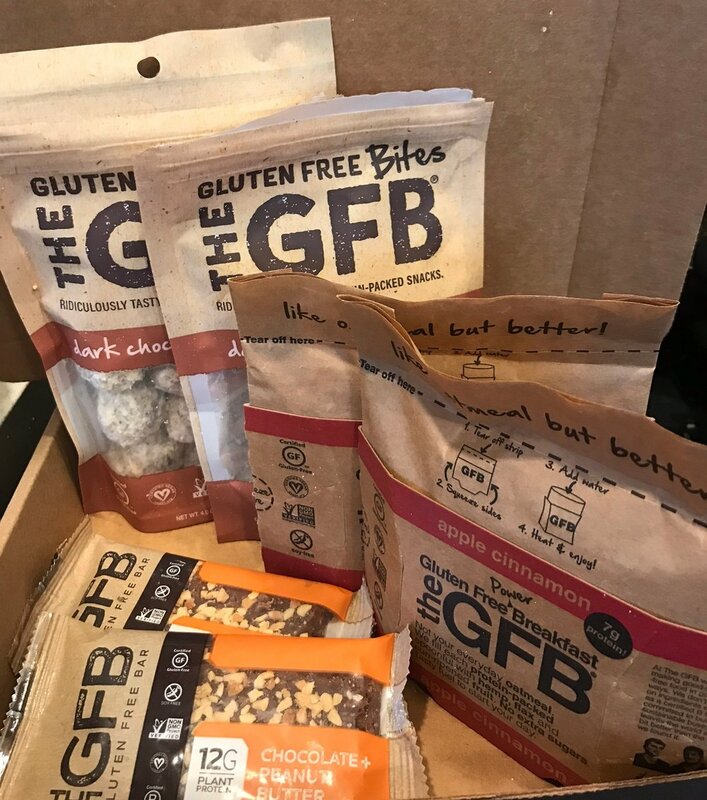 I would highly recommend The GFB to anyone that has to eat gluten free or soy free. Like eating a truffle rolled in delicious coconut flakes, but thy’re packed with simple ingredients and honest nutrition. It’s a little chocolate ball from heaven. Around 100 calories per serving, if your counting. I have always loved anything coconut, it’s the best snack ever (to me) so when I opened the bag and popped on of these in my mouth I was instantly in love. Delicious! So filling, so delicious, so peanut buttery & so good. Their chef combined rich dark chocolate with fresh roasted peanuts to create an irresistible treat. But don't be fooled by the decadence -- these are filling and healthy snacks! So cool, perfect on the go breakfast, or sitting on the couch or kitchen table, either way this breakfast is delicious. I had mine for lunch. This power breakfast was so filling, kept me full for hours and had a delicious crisp apple and cinnamon taste. I could eat one every day. Tart, sweet apples mingle with aromatic cinnamon to transform your breakfast into a flavorful treat that fills you up and gets you going. simple, non-GMO ingredients: certified gluten-free oats, dates, dried apples, raw hemp seed hearts, toasted sunflower seeds, flaxseed, cinnamon, sea salt.